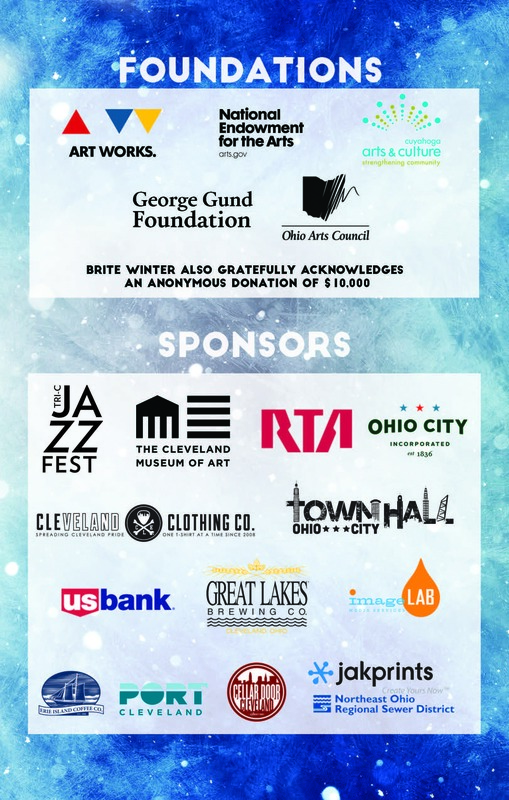 Brite Winter - "Cleveland’s Premier Winter Art & Music Festival"
What more can we say? Cleveland knows how to have fun in the winter! We had a a great time at these two outdoor winter spectaculars! 2015 Ice Fest at North Coast Harbor was a three-day event over the February 20-22, 2015, weekend. We knew we would not able to attend the fun daytime actvities at Ice Fest, since we had a very busy weekend already planned with Friday's PechaKucha Night Cleveland, Saturday's WebSigCleveland.org meeting, and Brite Winter, plus other family commitments. Finally, we planned to end the weekend with Sunday's joint meeting of Film & Forum - Cleveland/Cleveland Machine Intelligence discussion of the artificial intelligence film, Her. All really great events! Yet, after seeing all fun activities online via @NCoastHarbor and the #IceFestCLE hashtag, we decided we HAD to make the time to stop by in the evening as we were heading to Brite Winter. When you see our photos of the impressive sponsors' ice sculptures, you will know we were happy we made the time to stop and see them! Here are tweets we saw leading up to @NCoastHarbor's #IceFestCLE, and our @sos_jr tweets with the photos from our visit. We recommend following @NCoastHarbor to learn of more Cleveland happenings. We already see @NCoastHarbor promoting their next big thing. @sos_jr thanks for stopping by! Thank you to all the sponsors of the 2015 Ice Fest at North Coast Harbor who made this event possible. We truly enjoyed seeing the ice sculptures! We go to Brite Winter every year. It is a must-attend event. Held on February 21, 2015, this year's Brite Winter was bigger than ever! It had a record number of bands and art installations. February 21, 2015 from 4:00 pm – 11:00 pm in Ohio City – Cleveland, Ohio. In addition to three outdoor stages, Brite Winter will feature artists at Great Lakes Brewing Co. Tasting Room, Market Avenue Wine Bar, Old Angle Tavern, Mitchell’s Ice Cream and Town Hall. Brite Winter is an outdoor, winter art and music festival in Cleveland, OH. The festival, founded in 2010, is a free event that is made possible through donations, community grants & partnerships. The 2015 Brite Winter Festival will feature art installations, games, activities and more than 60 musical acts across the Ohio City Market District including three outdoor stages and five indoor stages. MOCA - Museum of Contemporary Art Cleveland (@MOCACleveland) - Bringing modern art to Cleveland. We learned about the #AloneTogetherMOCA The Visitors exhibit. We recommend you attend their FREE first Saturdays of each month events, since they are a fun way to get to know MOCA Cleveland. Great Lakes Science Center (@GLScienceCtr), home of the NASA Glenn Visitor Center (@NASAglenn) - Bringing science to Cleveland. We learned about #YurisNightCLE that night, but we recommend also checking out many of their other science programs. See our Great Lakes Science Center's Science After Dark: MythBusters blog post, as well as others we have written about the Great Lakes Science Center. Thrive Cleveland, A Happiness Incubator (@thriveCLE) - Bringing happiness to Cleveland! We learned how they have over 20 volunteers planning happiness happenings in our area. A friend of Stuart's had told him about this group, but this is the first time we have talked to some of their leaders. We enjoyed watching Rust Belt Monster Collective create murals tonight, and in the past at Ingenuityfest Weekend (@Ingenuityfest) (see our Cleveland Technology + Art = Ingenuityfest Weekend 2014! blog post). We also learned tonight about their bi-monthly Drink And Draw Social Club Cleveland meetings at Great Lakes Brewing Company (@GLBC_Cleveland). We share photos, articles, and we hope, the spirit of the evening, through our @sos_jr tweets and retweets. Particularly with the organizations mentioned, please take time to learn about their activities. Enjoy! @sos_jr @Britewinter thanks for sharing! Definitely looking forward to this year as always.
.@mrwheeler Yes, good to meet U at @TechPintNews' TechPint. I hope we connect again at @PKNCLE & @Britewinter this weekend. Navigate through #Brite15 tomorrow with our tweets. We'll tell you where & when the bands are playing. Make sure to use #Brite15! Hoping everyone will use #Brite15 so we can retweet a lot of great pictures, etc.
.@PKNCLE Thanks for the plug last night! See all tonight! Don't miss our #YurisNightCLE Street Team at #ClevelandComicCon all weekend and visit our booth at @Britewinter in Ohio City Saturday night!
. @SalvaOttawa Great after meeting U at @clevelanddotcom's TweetUp to talk to U at @PKNCLE yesterday! Sorry missed U tonight at @Britewinter. @sos_jr likewise! I'm sure we'll bump into you soon. There's always something fun happening in #Cleveland! â€œ@sos_jr checking out DASHBOARD CONFESSIONAL by @HeyaEverybody at @Britewinter's #Brite15. pic.twitter.com/o1GLPWQqosâ€ Brite Fest was super rad! @Jayzola @sos_jr @Britewinter thanks jay! it was a great success & we're playing with the idea of bringing it to future venues! @HeyaEverybody @sos_jr @Britewinter that would be great if you do it again. Keep me updated man! Thank you to all the Brite Winter sponsors for a great evening! See our 2014 blog post: Cold Brite Winter & Hot Cavs Game -- it was 14° degrees in 2014 at Brite Winter!